BREA Photos (Portraits by Tom and Lisa Cuchara): Website sale extended!! Happy New Year! We had such a good response to our first ever sale, but some of you said that with the hustle and bustle of the holidays you missed it, so we are extending the sale of your photographs on our website http://www.tlc.smugmug,com/ until the end of January. We also made the coupon code simpler: just enter BREA2010a to save 10% !! So NOW is the time to make those online purchases -- save on photographs, gifts, canvases, framed photographs, even digital downloads from your photo session. Our website has grown and grown. We now have 63,597 photos uploaded and have used 141.28 GB of disk space -- Oh My!! So this New Year we will be starting to clean up and remove some of the older galleries. 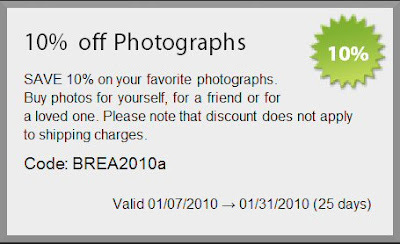 Why not take advantage of these coupons to purchase some more of your favorite photos (or some of the ones that you never got around to selecting). I know we took YEARS to finalize our wedding photos! This coupon can be used over and over again by you, by friends, by family until they expire. Please note that the discount does not apply to shipping charges.